Since we leave for Rome today to pick up our 80 pilgrims for a pilgrimage through Italy, Greece and Turkey, I thought I would post this article so you can see some of the churches we will visit. Here is the portion of the article in which I contributed. Teresa Tomeo also shares her favorite churches. 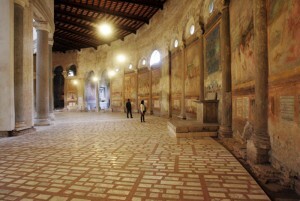 With Mother’s Day approaching, San Agostino, or St. Augustine, is a great place to visit, says Steve Ray, a tour guide whose company, The Footprints of God, leads frequent pilgrimages to Rome. St. Stephen’s in the Round is dedicated to Christian martyrs, including those who died in the gladiator games at the nearby Colosseum. 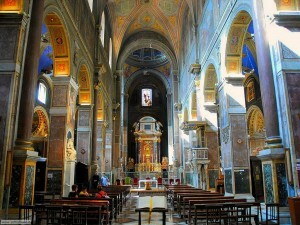 “It’s very special, because most of the churches in Rome are not round,” says Ray.